I can't believe it took me so long to make lunch notes with a Minecraft theme! Minecraft is my son's obession. If he's not playing the actual game, then he's watching YouTube videos of other people playing the game. I don't get it. He tried to teach me how to play, but I lost interest after about 12 seconds. It's just not for me (actually, no XBox game is for me because I can't figure out how to work the controller.) But I can't complain too much because Minecraft isn't really violent, and I can see my son thinking and planning when he's playing. 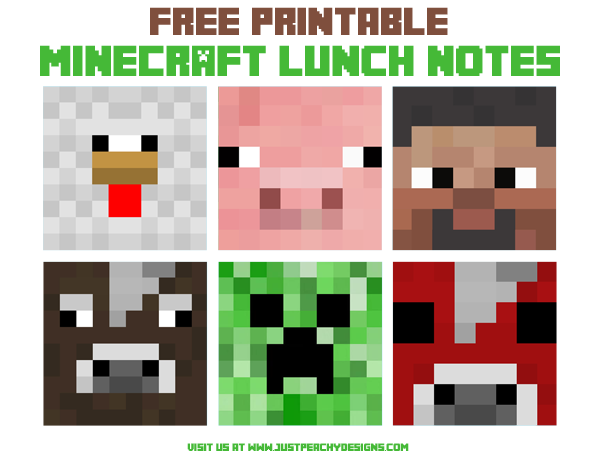 Anyway, here's some printable Minecraft lunch notes (or cupcake toppers, or whatever.) There's a chicken, a pig, a cow, a creeper, a mooshroom and Steve. They're just the faces. I couldn't think of a way to include a message on the front of the note without messing up its essential "minecraftiness", so I just write my message on the back. If you'd like to download them, just click on the link above. Enjoy!